Welcome to Marvel Strike Force Heroes page. This is the full description of MSF Nobu stats, skills and abilities. Nobu is an expensive HAND Controller who summons Ninja allies. His first skill inflicts medium damage and has a high chance to gain an assist from HAND ally. It also has a chance to apply Stealth to Nobu. His second skill summons 2 ninjas at 300% of their normal damage. Nobu’s ultimate grants one or two Counters to all allies. Additionally, Nobu provides his HAND allies with a chance to revive upon death. Nobu is very expensive considering his abilities, and his price is 100 shards obtainable through Premium Orbs, Mega Orbs, and Alliance War Store. 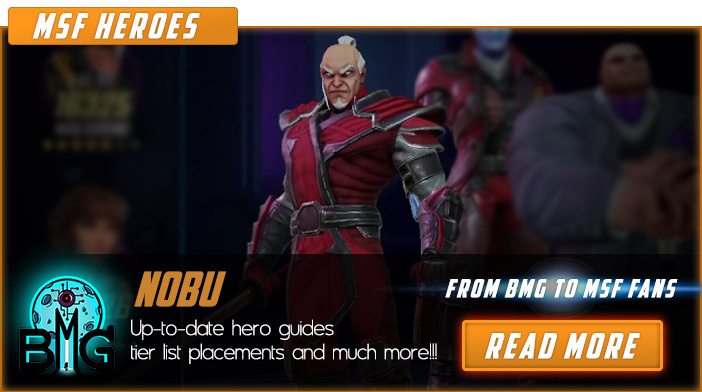 We hope that you enjoyed the description of MSF Hero Nobu. For detailed information about other MSF Characters check our MSF Heroes page.